It has been said that necessity is the mother of invention. 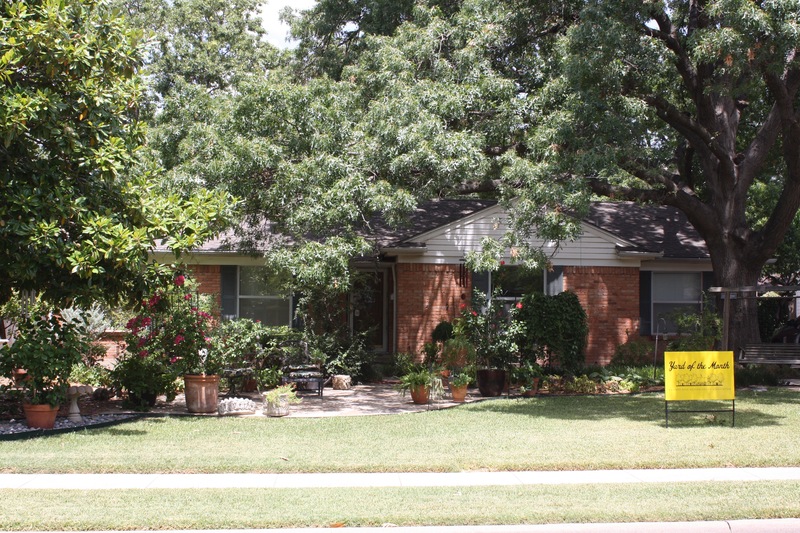 Four years ago, we were faced with the typical Heights Park front yard that had been suffocated with four years of drought, fungus invasions and the ever expanding shade of a 60-year-old Red Oak and 22-year-old Magnolia tree. We tried multiple St. Augustine sodding programs, but each suffered the same sad fate. We had clearly fallen victim to the definition of insanity — doing the same thing over and over but expecting different results. It was time to reinvent both yard and purpose. We designed a three-year plan that would convert the heavily shaded part of the yard to stone patios, sidewalks and plant beds, while reducing the grass portion to become both an accent and manageable in times of drought. The area of grass would be designed to get full sun and yet be fully maintained by hand watering. My aged sprinkler system had become water wasteful and unreliable in coverage. The patio layout was designed to create an inner sanctum under the arching limbs of the Red Oak. The detail of both design and garden was intended to be appreciated from within, yet appealing from the outside. Further color and accent was to be provided by Jenny’s passion for container gardening. This would allow for plant rotation and the green-housing of typically hardy zone 8-9 plants. Tuned wind chimes and solar charged “hobbit” lights gave the final touches for the times of evening meditation. Bark and river rock were used to provide a variation of texture, while bird baths and feeders attract mockingbirds and cardinals. It was designed and built for a purpose, but it has not been without failures. Experimentation with bedding plants is ongoing. The shade still reduces our options in flowers and shrubs, and attracting butterflies and hummingbirds remains a challenge. This summer’s early and endless heat has tested our yard’s design, and yet, we are Yard of the Month in August That has to say something. Thank you neighbors for awarding me with Yard of the Month! Our neighborhood has so many great looking yards; it’s an honor to have won! The redo of my yard has been a long time coming. I bought my house at the end of 2015 and decided the interior needed renovation first. It took about a year and a half to get everything on the inside done to my liking. Once I was satisfied with that, I knew the exterior was the next on the list to be done. I contacted Keane Landscaping, which really deserves the credit for everything. I did not know exactly what I wanted except something low maintenance yet beautiful. Alex Courtney met with me many times to share ideas but the best thing they provided was a 3-D mock up of how everything would look. I highly recommend this for anyone who, like me, doesn’t understand or know landscaping very well. A favorite feature of my new yard is the lights used to light up and cast shadows on my house at night. Thank you Heights Park Neighborhood Association for this great honor! 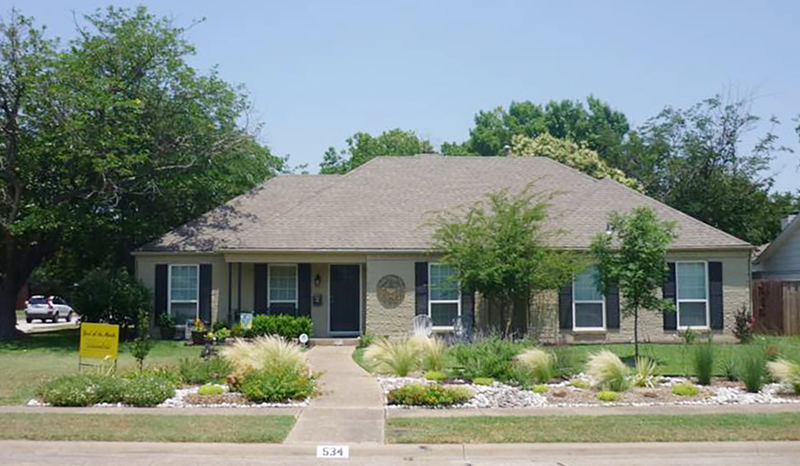 We are honored to be selected as yard of the month in a neighborhood with so many yards worthy of the award! We moved here in fall 2016 and felt welcomed by the neighborhood from the first day. Practically without fail, greetings from neighbors shifted to conversation about our home’s original owner — Mr. Freck Matthews, a true fixture of Heights Park. In addition to the consensus that he was an all-around great neighbor, many conveyed stories of how well he maintained his yard, such as how he pulled weeds by hand in the heat of summer. We wanted to carry his dedication forward as best we could. The goal for the landscaping was to reduce the amount of turf grass by adding a low-water, low-maintenance flowerbed. We also wanted to attract beneficial insects and wildlife; we are already seeing bees, hummingbirds, and butterflies enjoying the flowers. Unfortunately, the flowerbed is not as low-maintenance as we’d hoped thus far. Lesson learned: don’t underestimate the persistence of nutsedge and bermuda grass! Weed-blocking fabric did not stop them; layers of cardboard, mulch and good old-fashioned weed pulling by hand seem to be more effective. We are novice gardeners, figuring everything out through trial and lots of error. It’s a work in progress! We selected mostly native perennial plants that can handle the full and direct sun in our south-facing yard. 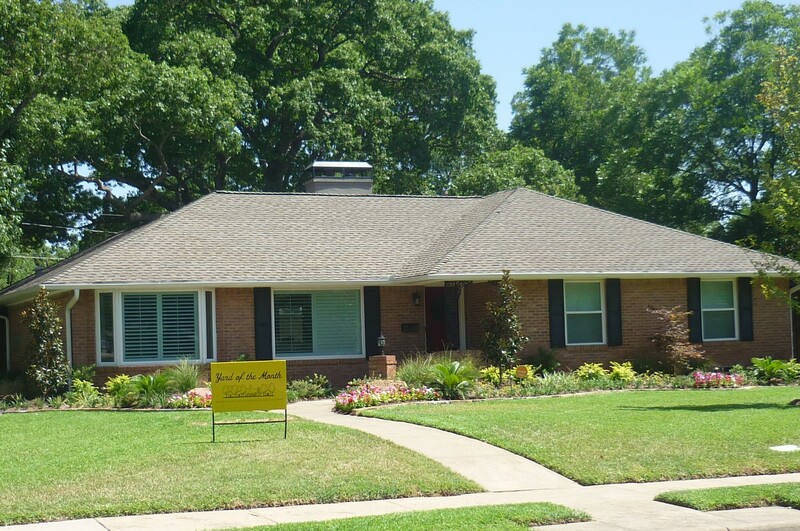 A lot of inspiration came from taking the city of Richardson WaterWise home landscape tours in 2016 and 2017. Nearly all of our plants regrew from the winter, and some are already re-seeding themselves. This spring, several white iris plants a neighbor gave us from her garden bloomed, and we look forward to seeing them multiply in future years. The Chinese pistachio tree was planted about a year ago, and will provide some much-needed shade to the front yard as it grows. 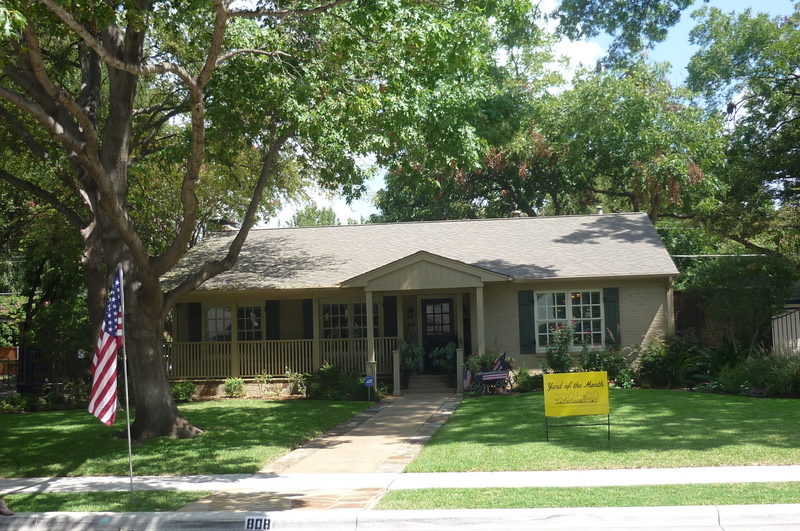 We are so honored to be chosen by the Heights Park Neighborhood Association as the Yard of the Month for May. 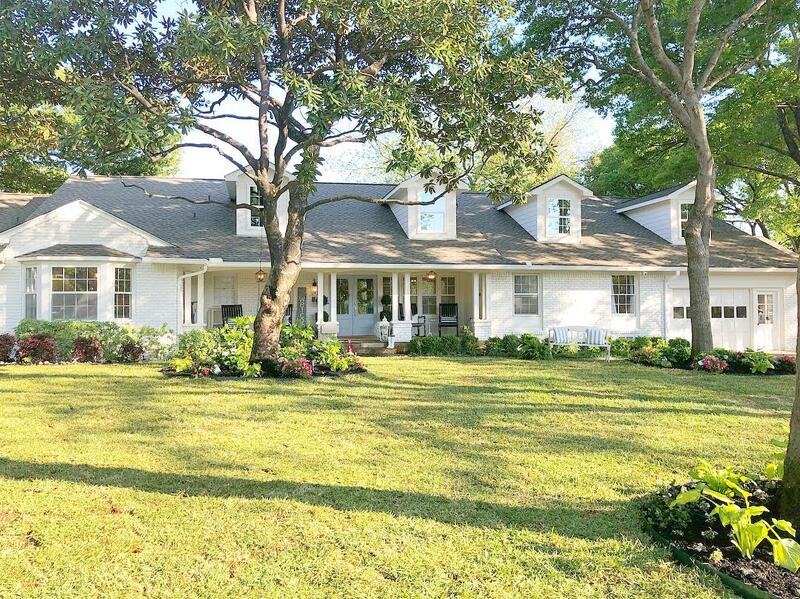 My husband and I bought this home in November 2017 and immediately began an extensive remodel of the interior, exterior and an addition. Many people don’t know how very special the street Thompson is to me and my family. My grandparents Milton and Bertie Newsom lived at 111 Thompson, where they raised my father, his sister and two brothers and where they continued to raise 20-plus grandchildren and great-grandchildren. Although my grandmother has passed, she was my greatest inspiration in my design for our front yard. I wanted a place where I could sit out on the front porch and think of her and all of the fun we would have running up and down the street. She had the most amazing blue Spode China collection that was an inspiration for the interior and exterior of my home. I love the Southern feel of plush blue hydrangeas and the way they draw out the blue tones in our front door and the Spode vases on our porch. The pink drift roses were the bright pop of color that the white exterior needed to bring cheer. After trimming back and cutting down a dead tree to bring more sun, we were able to lay all new sod and create more beds in the front with fresh flowers for spring. We are loving the new, fresh look that the yard has and all of the grass space for our 2 year-old to run around.